NAA member artists demonstrated their talents as guests strolled around the Naples Sailing and Yacht Club sipping French wines and Kir Royales, the drink invented in Lyons to celebrate the U.S. liberation of that city during World War II. A French chanteur, Michelet Innocent, performed a variety of smoky French bistro classics. The evening was capped with a live auction of a dozen works of art donated by previous winners of Naples National events. A professional auctioneer from Leslie Hindman Auctioneers insured that bidding was enthusiastic, quick and widespread. The Platinum Donor for the event was artnet AG. In addition, many individuals subscribed to patron tables, underwriting early expenses. In all, the inaugural event netted about $25,000 for NAA programs, including the children’s art scholarship program and community outreach. Many volunteers assisted with logistics helping to make the whole experience smooth and enjoyable. This was the first event of its kind for NAA, and it has helped the organization prepare to throw an even bigger celebration for its 60th Diamond Anniversary event on Feb. 20, 2014. Stay tuned for more exciting announcements and activities in the works. Individuals interested in volunteering on the 2014 gala committee should contact John Hushon. February was packed with energy and excitement with three new exhibitions, Nuts About The von Liebig, Art in the Park, our inaugural gala fundraiser, the 34th Annual Naples National Art Festival, art classes, workshops and ART Connects lectures. More than 25,000 people visited events with the Naples Art Association this month, and $5,300 was awarded in cash prizes to top artists. Were you here? Check out the photos below and share the fun with your friends! Volunteer Liz Black is a long time friend and fan of fashion artist Herion Park. 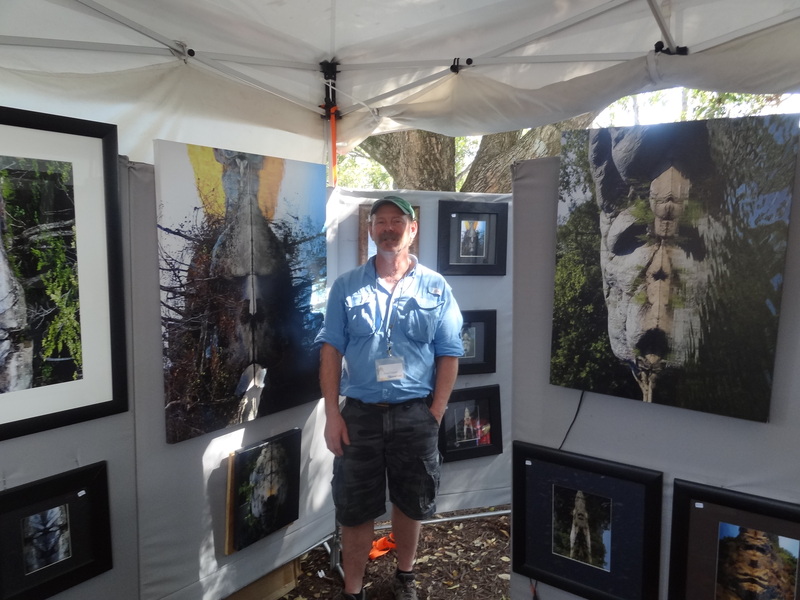 Taken at 34th annual Naples National Art Festival. 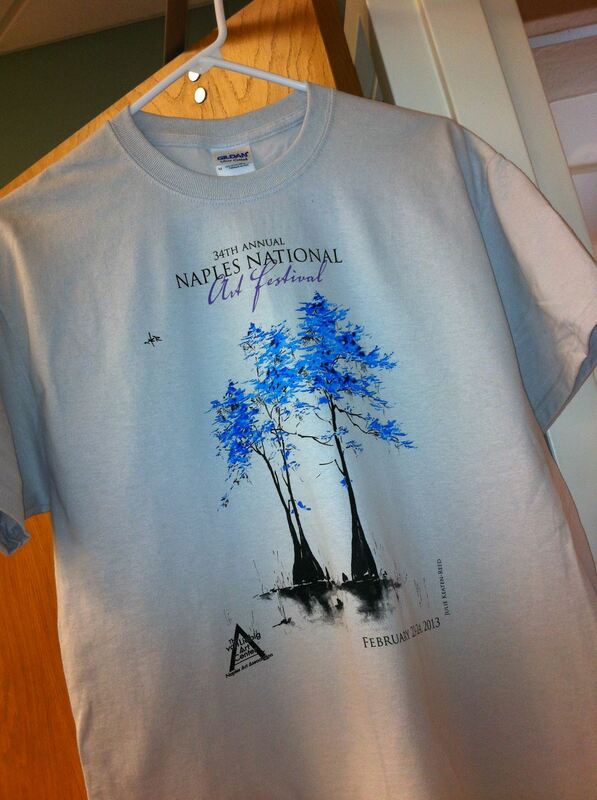 Julie Keaton-Reed is the 2013 Naples National Art Festival t-shirt artist! The commemorative fashion is sold at the festival for just $15 each, benefitting art education programs by the Naples Art Association. Jennifer Gruppe, Mary Ann Eberspacher, Robert Gruppe at the preview reception. As a longtime admirer of his work, Mary Ann was pleased to meet Robert. The von Liebig Art Center attracted hundreds to the preview reception for Following Footsteps: Three Generations of Gruppe Plein Air Painters, the Adult Student Exhibition and the Members Gallery “Scene in Naples” show. 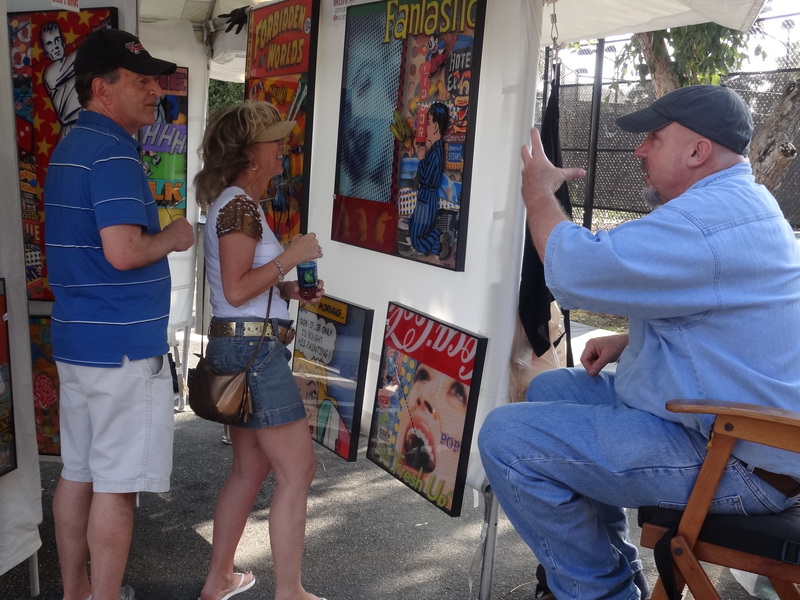 The Naples National Art Festival in Cambier Park and along Park Street, hosted by the Naples Art Association, features more than 260 artists from around the country through today (Sunday, Feb. 24) from 10 a.m. to 4 p.m. Top artists will take home a total of $5,000 in prizes. 2013 Best in Show goes to Sculpture Artist John Petrey. Earning the top 2D category award was Photographer Cali Hobgood, and the top 3D award goes to ceramic artist Michael Schwegmann. Ten awards of distinction were also selected. Two art professionals evaluate each artists’ work to select the winners. R. Lynn Whitelaw juried the 2D artwork. He is the curator for the Leepa-Rattner Museum of Art at Tarpon Springs Campus of St. Petersburg College. 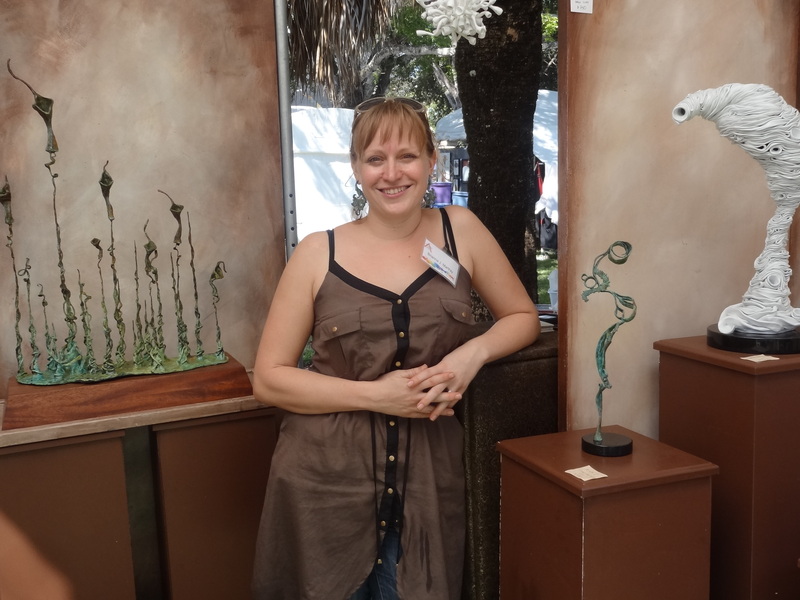 And Marisa J. Pascucci, curator of 20th Century & Contemporary Art at Boca Raton Museum of Art, juried the 3D artwork. Whitelaw was pleased overall with the quality of photography in the Naples National Art Festival. “It was good to see photographers moving out into new directions with the process, featuring new subjects and perspective.” Particularly taken with photographic artist Cali Hobgood’s work. “She has taken on a singular focus in each of her images, which are really just everyday objects. But she is giving them monumentality.” This idea was expressed by both judges about award winning artists this year, how every day – mundane, even – objects were used and elevated in artwork and the commentary it may suggest of idea that art makes us stop and look at details that we might not routinely notice. Awards winners and their artist statements are listed below. For those with websites, this article links to them; just click on the blue names. 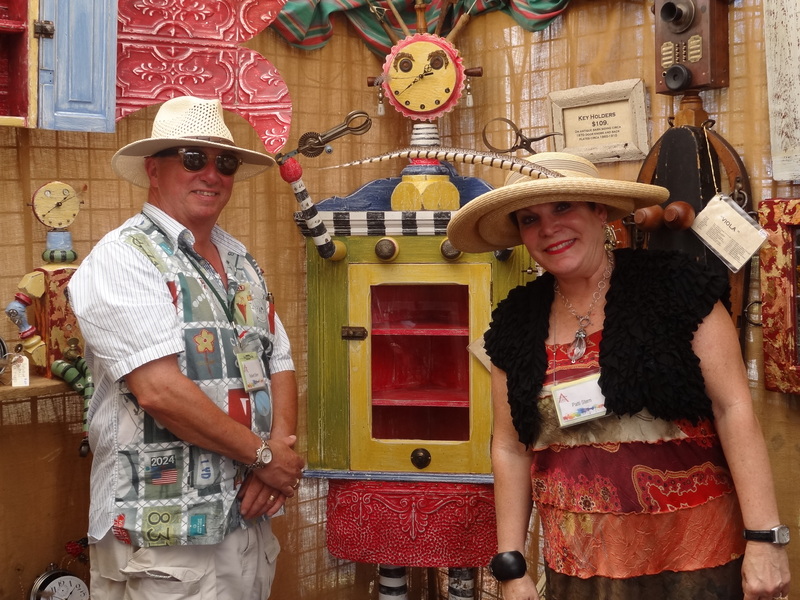 John Petrey, Sculpture, Chattanooga, Tennessee: I create whimsical sculptural dresses from vintage and found objects. They range in size from table top pieces to larger than life. Cali Hobgood, Photography, Urbana, Illinois: Photographs printed in a traditional wet silver-process darkroom and then painted, using oils. Michael Schwegmann, Ceramics, Champaign, Illinois: I hand form these pieces from wheel thrown and hand built porcelain pieces. I glaze my work to look like corroded metal, and then I also apply other glazes. These additional glazes complete the illusion of the object, indicate the true material (ceramic), and add another layer of beauty or sculptural interest. Brianna Martray, Bronze Sculpture, Hannibal, Missouri: I’m fascinated with biomorphic shapes that are repeated throughout the microscopic and macro-cosmic. Within that context, I think of myself as a landscape artist exploring new possibilities of surreal and unique flora and fauna. Everything is unique cast bronze, or stainless steel, lost wax method. All pieces are one of a kind. 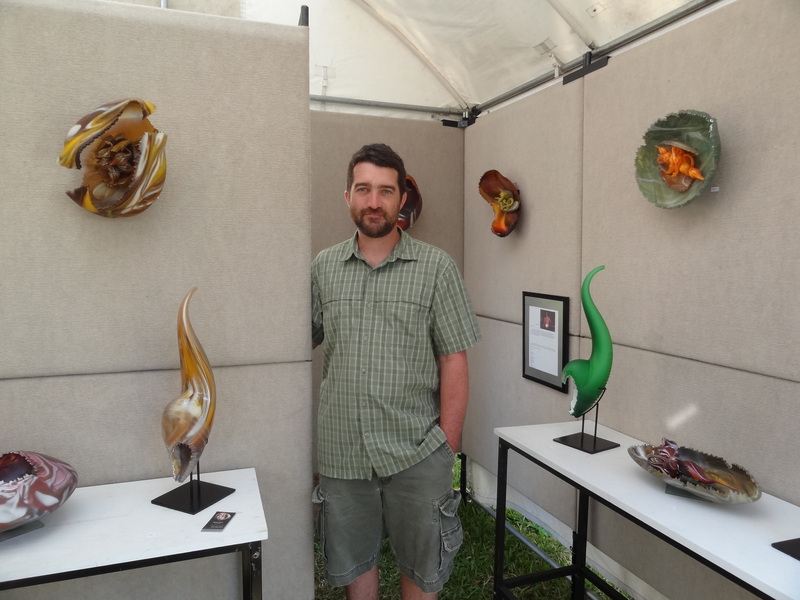 Richard Ryan, Glass, Bourbonnais, Illinois: Blown and hand carved glass sculptures. Colors are layers of glass. Carved using diamond wheels and sandblasting. My goal is to create work that appears to be alive. Patti and Robert Stern, Mixed Media 3D, Moreland Hills, Ohio: we construct clock head sculptures and curio cabinets using architectural antiques..They resemble the human form. We paint and glaze the finishes for antiquity. Alison Bear, Jewelry, Gainesville, Georgia: Working between historic artworks and modern aesthetics my work is a fusion of old and new. Inspired by Russian Icons and Russian architecture through the years as well as the delicate work of the Victorian period each piece has strong lines influenced by architecture, such as St. Basil’s Cathedral, with a juxtaposition of delicate, feminine, and intricate detail of Victorian wardrobe and jewelry. The pieces become modern through their contrast, boldness, and size on the wearer. They are wearable art that create a statement. Kevin Desplanques, Furniture, Mancos, Colorado: I craft my unique furniture using the stack lamination process. This process allows me to create unique shapes that can only be accomplished by using this technique. I believe that my sculpted chairs are the most comfortable and ergonomically correct chairs available. This level of comfort can only be achieved by hand sculpting every element of my furniture. In addition to my wooden chairs I will be introducing a full line of cast bronze furniture soon. All of my wooden creations are one of a kind and I make a conscientious effort to make every piece totally unique. I am asked by many woodworkers if I use computer automated equipment to create my forms. I take this as a great complement to the precision I achieve using only my hands, eyes and creative mind to guide me through each creation. I rarely use exotic woods but occasionally I see such beauty in a piece of wood I feel compelled to give it life in one of my pieces. I believe that my chairs re-define the term, functional art. Bruce Peeso, Pastel Painting, Massachusetts: Acrylic paintings on board designed to emphasize the vastness and peacefulness of the American landscape. I personally do all of the painting, matting and framing for all of my images. I travel extensively taking 4×6 photo reference for my paintings. Steve Pidcock, Photography, Lancaster, Pennsylvania: The influence my father had on my life with photography has been profound. I would watch as he would waste film and my time taking a photo of a dead tree or a fence post. One Christmas I was offered cash or my father’s old used Miranda 35 SLR camera. I took the camera. I started to take pictures of fence posts and dead trees. I found the beauty thru the lens that he found in texture and lighting. George Pidcock was a semi professional photographer and taught me the basics of black and white, darkroom, and camera functions as well as the passion of exploring ideas, and environment. As an educator in the school systems he taught photography as well as other academic subjects. Rick Abrams, Digital Art, Deland, Florida: Digital collage shadowbox created by combining found media, objects, and pictures into a seamless multidimensional format. 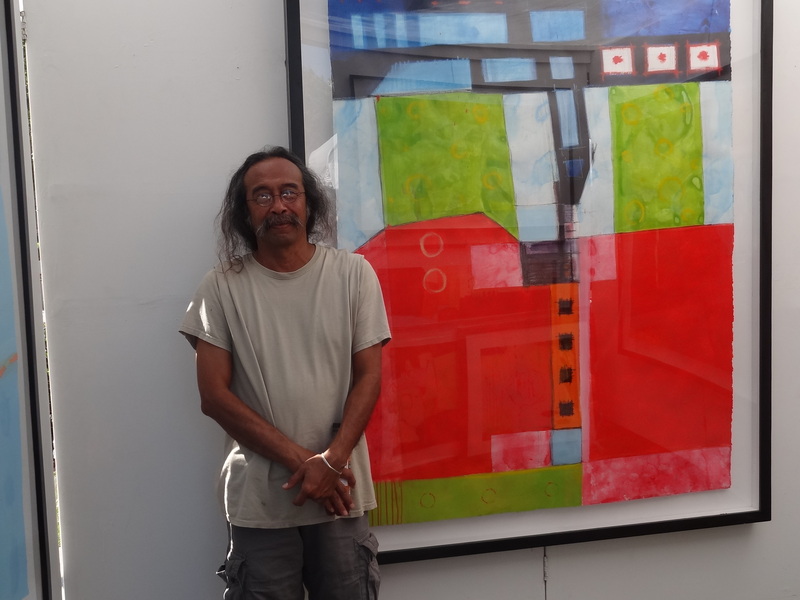 Ummarid (Tony) Eitharong, Mixed Media 2D, Orlando, Florida: acrylic, charcoal, oil stick on large water color paper. Its mission is to educate and promote visual arts in Southwest Florida. Through its programs, the Naples Art Association is dedicated to serving individual artists of all ages and skill levels, along their creative journeys. The NAA operates The von Liebig Art Center, located at 585 Park Street in downtown Naples. It’s open Monday through Friday, 10 a.m. to 4 p.m., Saturdays in season. For more information, please call 239-262-6517, visit http://naplesart.org/, like us on Facebook at http://facebook.com/vonliebigartcenter or follow Twitter at http://twitter.com/vonliebigart. 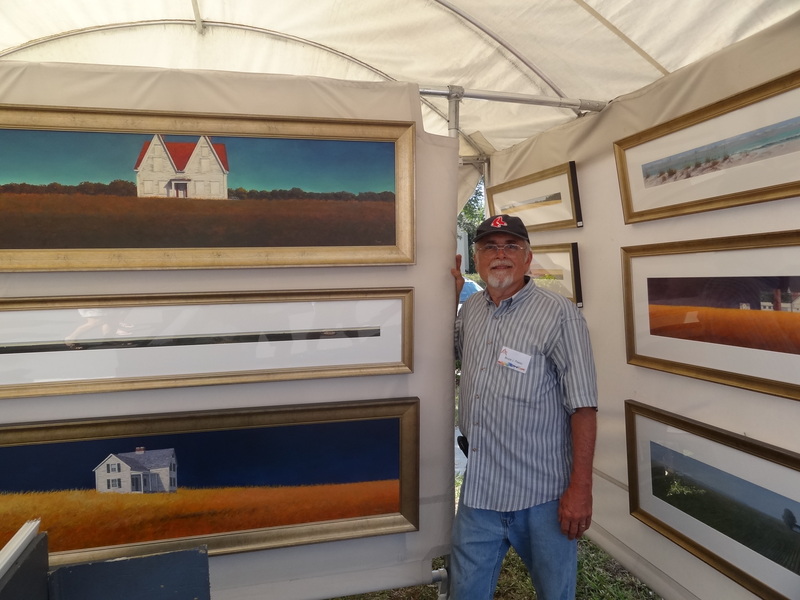 In March, the Naples Art Association hosts two of Southwest Florida’s nationally top-ranked art festivals in two of the hottest spots in Naples! 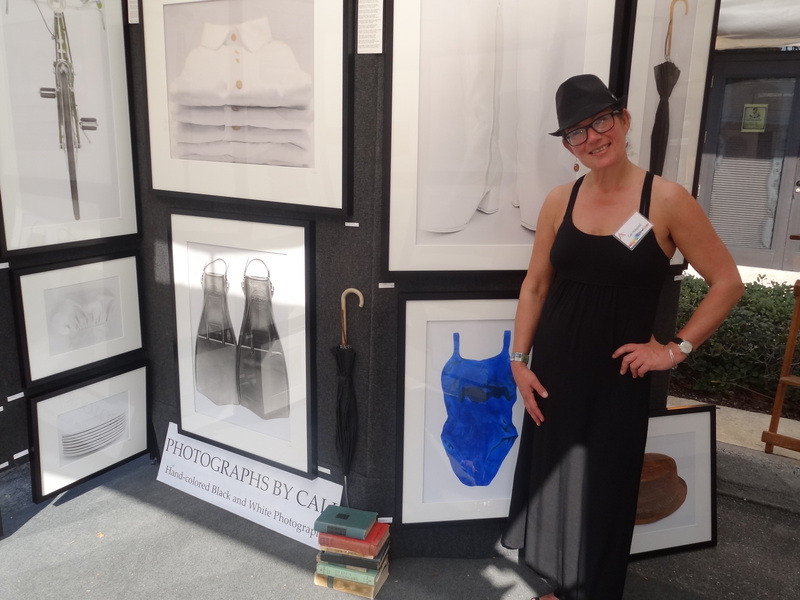 The Mercato Fine Arts Festival, which is the association’s newest art fair, earned a national ranking of #73 (rising two ranks from 2010) from Sunshine Artist magazine. This juried festival showcases works in all media by 100 artists from across the country. Anchored by businesses including Whole Foods Market and The Capital Grille, Mercato offers a trend-setting, ultra convenient mixed-use lifestyle that combines luxury condo living, high-end retailers, restaurants and a premium movie theater all on one prime site, just minutes from the beach. Festival guests enjoy not only fine art but fine dining as well. It also includes live entertainment on both days. On Saturday from noon to 3 p.m., the band Patchouli will play, and Sunday from noon to 3 p.m. features Bob Zottola and the Expandable Jazz Band. Click here to learn more about the artists who will be there. Held along 5th Avenue South in Naples, the Downtown Naples Festival of the Arts was ranked #21 best in the nation (rising three ranks from 2010) by Sunshine Artist Magazine. It’s coming up Mar. 23-24, 2013 and will showcase about 250 artists. 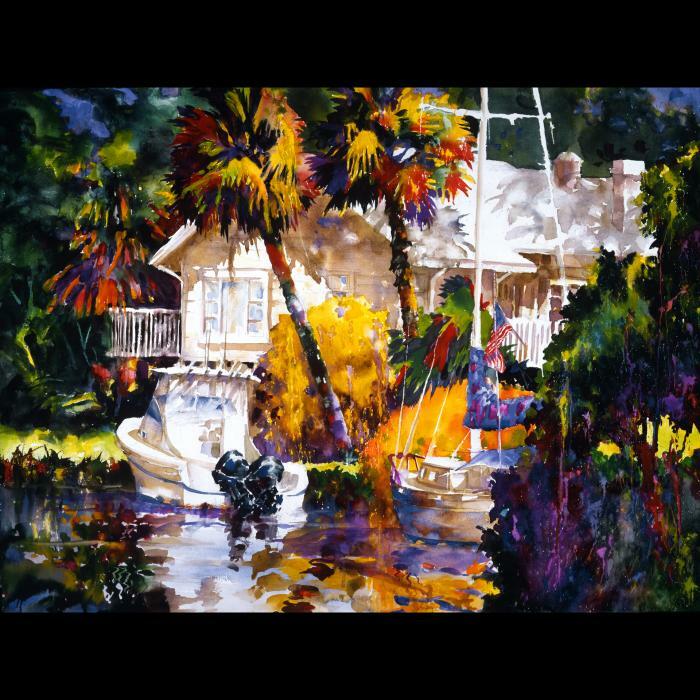 Hosted by the Naples Art Association, this is one of the last major art festivals of the winter season in Southwest Florida. Artists are eager to meet shoppers and share with them more about their works! Both festivals feature a wide variety of original handmade by the artist art work. Guests can shop for ceramics, digital art, fiber art, furniture, glass, prints, jewelry, metal works, painting, mixed media, photography, sculpture, wood and more. Because of their variety, these festivals provide excellent opportunities to find something new and exciting! At both the Mercato Fine Arts Festival and the Downtown Naples Festival of the Arts, there is something for every art budget and taste! The Naples Art Association gives special thanks to the generous sponsors of both of these festivals: Naples Daily News, Russell’s Clambakes, Lite 93.7, The News-Press Media Group, WAVV 101.1 FM, Costco Naples, and Gulfshore Life. 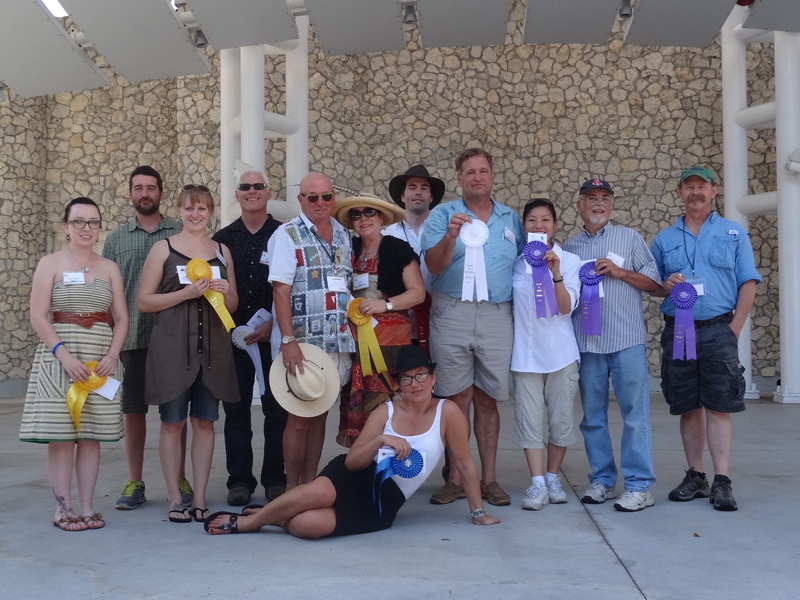 Naples Art Association (NAA) festivals provide a strong funding source for the nonprofit 501(c)3 organization’s art educational programing in Collier County. The NAA has been hosting outdoor art fairs for 55 years. Its mission is to educate and promote visual arts in Southwest Florida. Through its programs, the Naples Art Association is dedicated to serving individual artists of all ages and skill levels, along their creative journeys. The NAA operates The von Liebig Art Center, located at 585 Park Street in downtown Naples. It’s open Monday through Friday, 10 a.m. to 4 p.m., Saturdays in season. For more information, please call 239-262-6517, visit http://naplesart.org/, like us on Facebook at http://facebook.com/vonliebigartcenter or follow Twitter at http://twitter.com/vonliebigart. 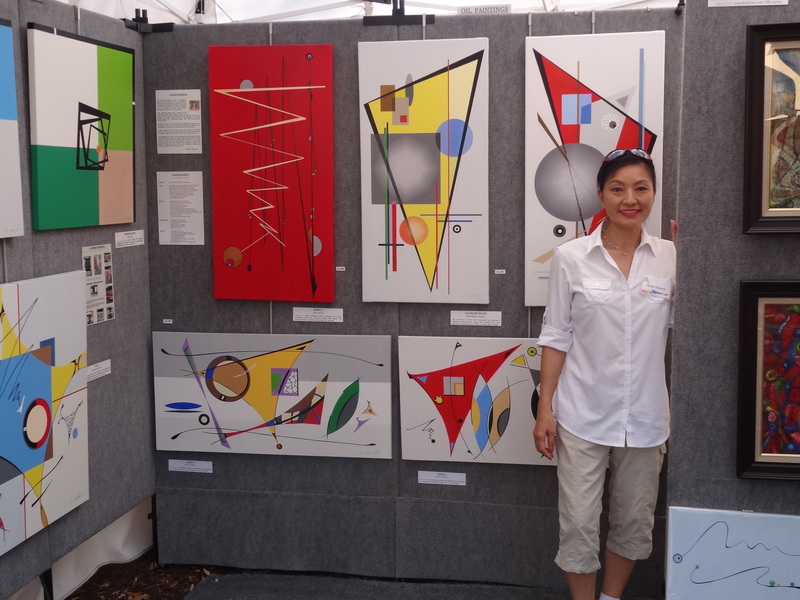 The annual Naples National Art Festival is consistently voted among the top 10 art festivals in the country by Sunshine Artist Magazine, and the local community continues to count the Naples National Art Festival among its premiere, must-see events. This festival features the talents of more than 260 artists from around the country and awards $5,000 in cash to top artists. The festival draws crowds in excess of 22,000. Don’t miss it! Saturday & Sunday, Feb. 23-24, 2013 from 10 a.m to 5 p.m. in Cambier Park and along 8th Street South in Naples. To view a list of artists and their websites, click here. This event is hosted by and benefits the Naples Art Association, a 501(c)3 nonprofit organization presenting educational art programming for Collier County and for artists of all ages and skill levels. This T-Shirt features the work of Julie Keaten-Reed. See more by her at booth #114, 115 this weekend. Julie Keaten-Reed is this Year’s Naples National Art Festival t-shirt artist! The commemorative fashion is sold at the festival for just $15 each, benefiting art education programs by the Naples Art Association. Check out more artwork by Julie at booth #114, 115 this weekend. 1:30 pm – 2:15 pm Hot Flashz, Inc.
Jim Holehouse is this year’s poster artist selected by the Naples Daily News Newspaper in Education. He is located at booth #107 throughout the festival, but he’ll also sign limited editions of this year’s NIE poster featuring his work. Posters can be purchased at booth #1. Special thanks to the generous sponsors of the Naples National Art Festival: Naples Daily News, Russell’s Clambakes, WAVV 101.1 FM, Florida Weekly, Lite 93.7 and Costco Naples. Coming from the North: South on I75 to Exit 105 (Golden Gate/Naples Exit). Turn right (west) on Golden Gate Parkway; proceed approximately 3.4 miles to Goodlette-Frank Rd. (CR851). Turn left on Goodlette-Frank and proceed approximately 1.7 miles. Turn right at entrance. Coming from the South: North on I75 to Exit 101 (Collier Blvd.). Turn left on Collier Blvd. (Rt. 951); Proceed to first light which is Beck/Davis Blvd. ; turn right on Davis Blvd. ; proceed approximately 5 miles where Davis Blvd and US 41 will join veering to the right. Stay in the right lane approximately .4 of a mile as you will turn right on Goodlette-Frank Rd. (CR851); Turn left at entrance. US41 from the North: South on US41 into downtown Naples. After passing Central Ave. get in the left lane as US41 makes a sharp left. Go two traffic lights after sharp left to Goodlette-Frank Rd; Turn left on Goodlette-Frank. Entrance will be on the left. US41 from the South: North on US41 to Goodlette-Frank Rd. Right on Goodlette-Frank. Entrance will be on the left. The Naples Art Association is a 501(c)(3) nonprofit organization, founded in 1954 by local artists. Its mission is to educate and promote visual arts in Southwest Florida. Through its programs, the Naples Art Association is dedicated to serving individual artists of all ages and skill levels, along their creative journeys. The NAA operates The von Liebig Art Center, located at 585 Park Street in downtown Naples. It’s open Monday through Friday, 10 a.m. to 4 p.m., Saturdays in season. For more information, please call 239-262-6517, visit http://naplesart.org. Marianne Megela uses this whiteboard to organize the layout of each festival. Peering up from behind stacks of applications and sticky notes, Festivals Director Marianne Megela smiles as she works out how the biggest Naples Art Association festival of the year will be set up. More than 270 artists will set up booths throughout Cambier Park and along 8th Street on February 23-24, but right now, this event layout is Megela’s masterpiece. And with even the smallest landscape change making an impact on the space and the mix of artists invited, it’s a new puzzle each year. 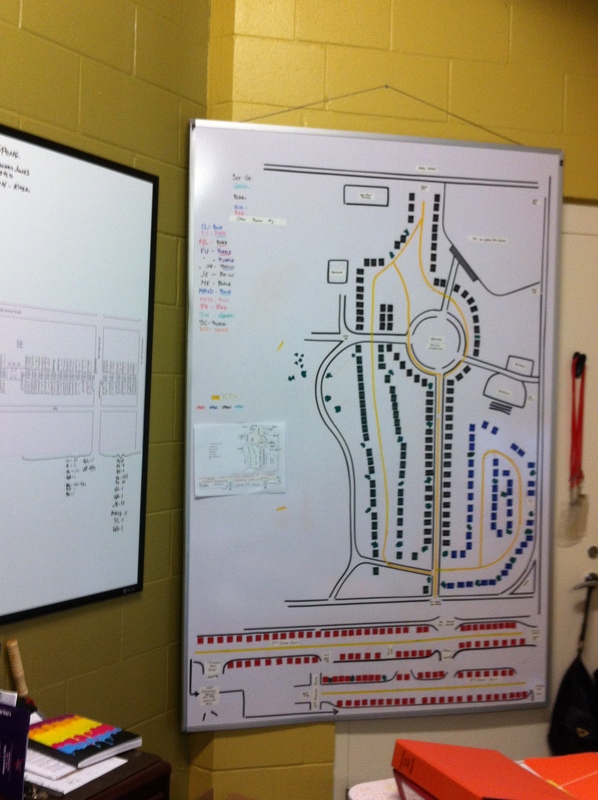 Megela uses a tall whiteboard and different colors and shapes of tiny magnets to create a mock-up of the festival layout. “This allows me to see the flow of the show through use of color walkways; the placement of the booths and the flow of categories; food vendor and cart placements,” Megela said. She’ll adjust the pieces on this set-up until everything is in place. Imagine: Artist tents sit side to side. Crowds flood every available nook between. In the middle of the day, shady rests are premium real estate. More people arrive every minute as the traffic flows seamlessly from one exquisite work of art to the next. This does not happen by accident. Megela pours over the natural setting. How low are the branches of this tree? Will people be able to step down safely from here? 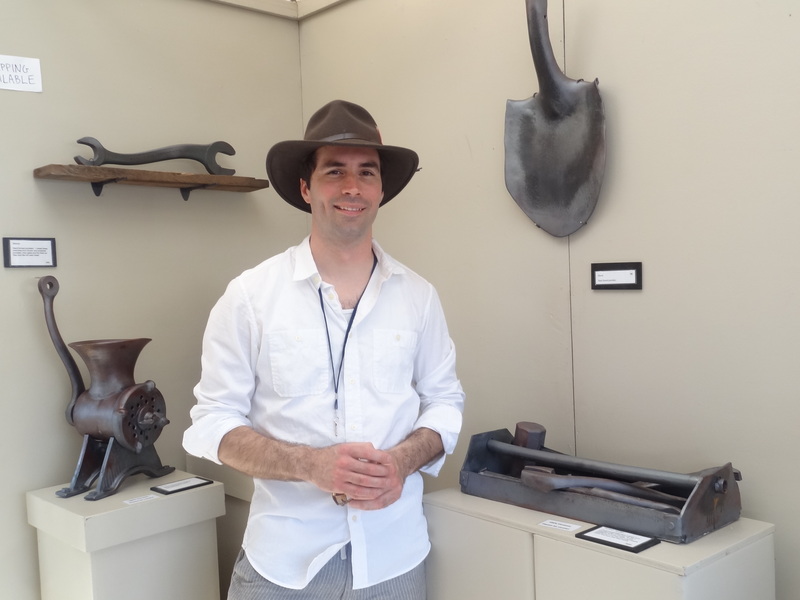 Oh wait – it’s better if these two jewelry artists are separated by a couple of different mediums, and this bronze sculpture artist would be much better here, where the sun can bounce attractively off of his reflective pieces. “In order to do this, everything must be taken into consideration such as trees, sidewalks, unleveled ground, etc. You not only have to be mindful of the ground but also what is above you. For example, you wouldn’t want to put an artist with 14’ height sculptures under a tree or place a tent next to a tree with low hanging branches that won’t allow the tent to be raised,” Megela explained. Often, artists wonder why their tents are placed where they are. Typically, there’s a well thought out reason every time. It’s all about presenting the artists at their best and creating a show that keeps the crowds engaged. She carefully measures out the walkways and often makes the most of end-of-row locations for artwork that is boldly eye-catching with unique shapes, colors and sizes to attract people to walk along that aisle. In this way, she’s crafting the show as one giant booth. “The artists get seen by more people, improving their chance of a sale. The aisles are wide enough so people have the freedom to stop leisurely to look at something without feeling pressured to keep moving,” Megela added. The biggest challenge, though, isn’t in the booth arrangement. Rather, it’s about aiming for the smoothest set up and tear down process possible. “Our city is open for business which means the vehicles of those 270 artists have to be brought into the city without disrupting the daily routine and still keep the artist setup as easy for them as possible,” Megela points out. No simple feat, but she is making it happen. Artists have taken note and compliment the process. 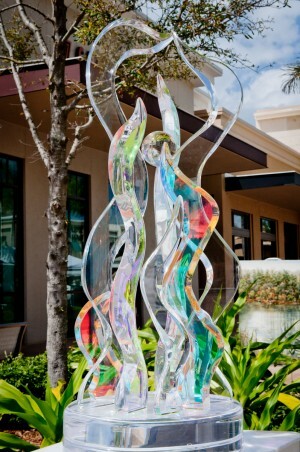 It’s one of the major reasons the Naples National Art Festival has been ranked among the top ten for many years. In 2012, it was ranked number nine by artists. Come experience it yourself! The festival is a major fundraiser for the Naples Art Association, a 501(c)3 nonprofit organization, and all money raised supports educational visual art programming within the Naples community. A voluntary $5 suggested donation is accepted at festival entrances. Aisles and aisles of well-displayed, hand-crafted, original artwork from around the country is on view. 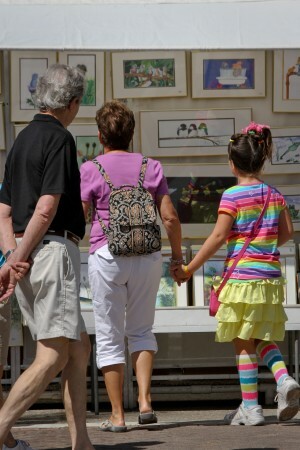 The Naples National Art Festival is Saturday and Sunday, Feb. 23-24, 2013, from 10 a.m. to 5 p.m. each day in Cambier Park and along 8th Street South in Downtown Naples. Live entertainment is provided throughout the festival and on the Bandshell stage. The mosaic mural will be on the left panel, shown here in the center, right near the entrance to the River Park Pool facility. completely glazed bowls for the Empty Bowls Naples fundraiser to benefit Harry Chapin Food Bank. mural by John Treanor, ARTScool instructor and former student and scholarship winner. ARTScool registration began in January..
Wine & Dezine with instructor Anne Chaddock. The parking lot across the street from The von Liebig Art Center was purchased by the city of Naples, and opened up about 60 new parking spots nearby. Building Art Up and Out! a workshop with Genie Kell had a tremendous day of show and tell! Naples Daily News Advertising Director Shawna Devlin presented workshops on branding and social media as part of ART Connects. Anne Dalton kicked off her series of workshops for artists on legal challenges of creative business. Jennifer Kozbial of Ars Nova String Trio during A-muse, a fusion event of live painting and live music in the Watson Gallery. Artist Tammra Sigler paints to the music. And the audiences were entralled. John T. Posadas, Jennifer Kozbial Posadas, Tammra Sigler, Aimee Schlehr and Adam Satinsky. A Business After 5 event with the Greater Naples Chamber of Commerce. Rochelle Moore, Betsy Dawson, and Tracy Pospeck, board members of Empty Bowls Naples, came to glaze a few ceramic bowls with the Naples Art Association. January 2013 at the Naples Art Association was a whirlwind of energy following the holidays. ART Connects began. That’s the new Naples Art Association series exploring the power of creativity and including workshops for artists about the business side of their career. Crowds filled Fifth Avenue South and Park Street on the first weekend of the year for the Downtown Naples New Year’s Art Fair and Art in the Park. Art classes and workshops were full of passionate and talented art students. ARTScool 2013 classes were announced and registrations have begun. The NAA had a chance to partner with Naples businesses and nonprofits as well. Check out this gallery for a glimpse!